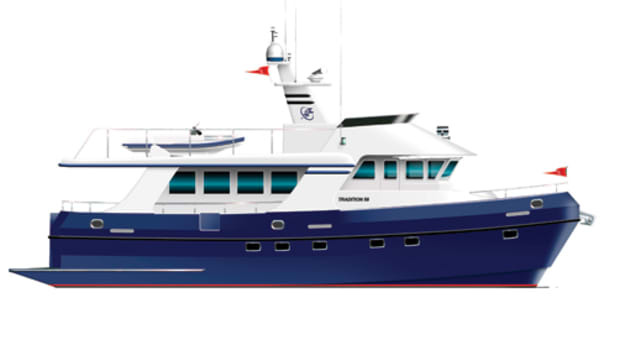 Long established as a builder of motoryachts and expedition vessels, Northern Marine has introduced its latest long-range cruiser, a 64-foot raised-pilothouse trawler. Her systems are designed to be serviceable in remote areas, while her bottom is a resin-infused, solid-fiberglass laminate, reinforced with Kevlar around the bulbous bow. Protecting the keel is a 12-inch-wide steel shoe extending the full length of the hull; forward, it&apos;s one inch thick, but along the after 16 feet of the keel, it&apos;s a whopping 11⁄2 inches thick. 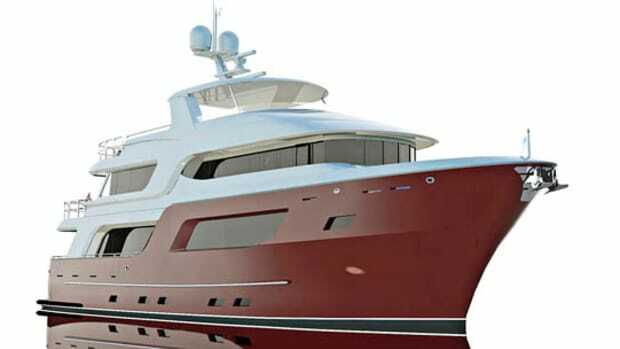 Not only is she built to endure the perils of the sea, but her full-displacement hull form is also engineered to be comfortable and dry in a seaway, thanks to ample freeboard and generous bow flare. Moreover, the bulbous bow will help reduce pitch motion while improving fuel economy. To reduce roll, the 64 is fitted with digitally controlled TRAC active-fin stabilizers. 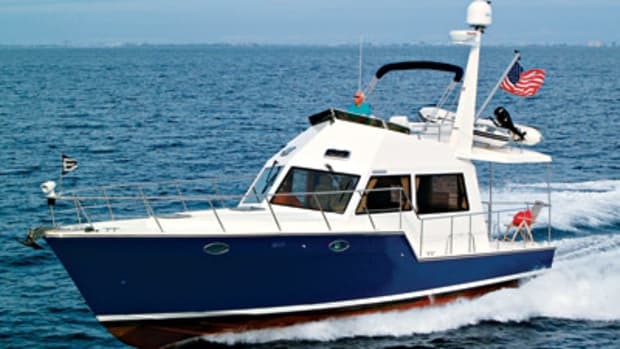 For peace of mind, she&apos;s also outfitted with a hydraulic get-home drive and hydraulic bow and stern thrusters. Her single engine and both gensets are soft-mounted, and her machinery space is fully insulated for sound and vibration control. A clever over-under design trick creates the illusion of a full-beam interior while retaining virtually all the function of a walkaround configuration. Amidships, a stairway goes up and over a bump-out in the galley, allowing passage from the side deck to the foredeck via the boat deck. Or from the boat deck you can detour to the flying bridge without traipsing through the interior. On the port side, the bump-out allows a nifty stairway to the lower decks. 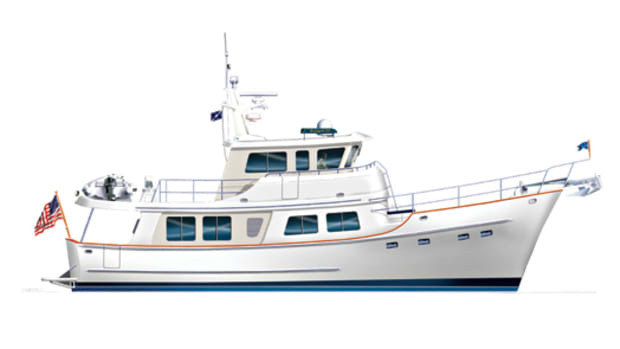 Three steps down is a landing, with a doorway to the master suite; located directly beneath the pilothouse, the stateroom is relatively high in the hull, extending full beam and with two big ports on either side. From the landing another stairway leads aft to a roomy guest stateroom on the lower deck. 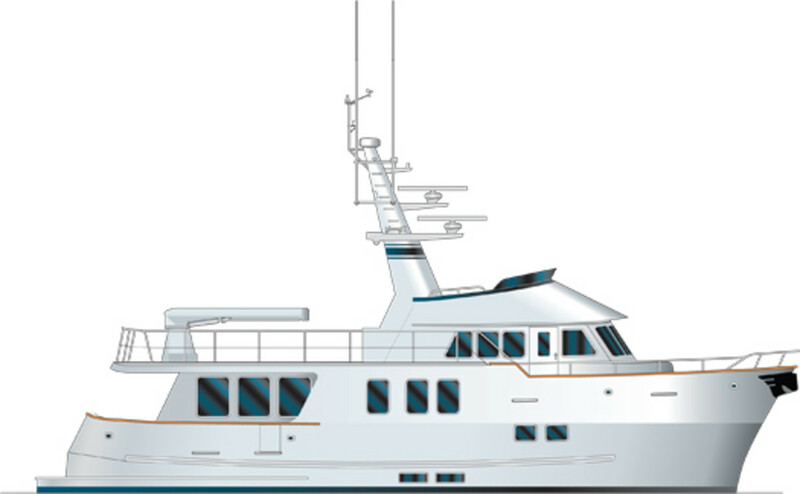 Separate stairs from the pilothouse lead to the third stateroom under the foredeck. For more information on Northern Marine, including contact information, click here. This article originally appeared in the July 2008 issue of Power & Motoryacht magazine.